Has 4 neutral handles spaced out that are 2" thick. Can also use the straight bar. Gives you plenty of options while performing bent over rows. Attachment is raised to the height of a 45lb plate to give you full range of motion. Use with a landmine for bent over rows. Landmine Landmine Single Handle Landmine Close Grip Row Regular Grip Thick Grip Straight Cable 2"
Like other BW products I've bought - built like a tank and high quality. The 2" diameter pipe rocks. I looked at lesser-quality versions of this but this is by far worth it over others. BW clearly designed this purposely to extend a certain distance from the bar but I was concerned that I would not get a full extension top or bottom with this. Not the case, though - I am able to get full extension up and down and the grip placement hits area of the back you wouldn't normally hit. Good Product. 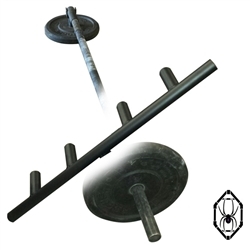 Allows the lifter to utilize large volume of weight while performing shoulder retraction. Good job. Great piece of equipment, but did not expect the grip to be a fat grip. Makes the movement more challenging, but my grip is more taxed before my back. Have to use straps. However, the multi grips are great variation to rowing. I've had this a couple of weeks now and am very pleased with it. The multi-grip t-bar landmine handle is like everything else I've gotten from BWTG: it's well-built and offered at a reasonable price.